No matter what condition your life may be in, it is never too late to become the great woman of God you were supposed to be! In the Bible, Jesus showed us both in action, deed and through His incredible parables that our lives were meant to be used to touch others and change the world. 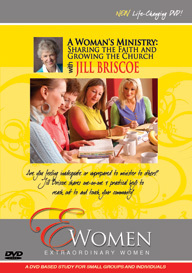 Jill Briscoe, a worldwide speaker, author and pastor’s wife shares powerful keys that will change the way you view ministry. Learn to be obedient to the call of God in your life and brave enough to share your faith.